Mobile review : Samsung Galaxy Note Edge 4G - The news, articles, reviews, comments, prices of laptops,cameras, mobile,tablet,,multimedia,printer,scanner. With so many phone makers releasing large-screen devices these days, it can be easy to forget that Samsung was the one that started the phablet craze. It did so, not only by increasing display dimensions, but also by adding features, such as a stylus and dual-display modes, to enhance the overall user experience. This has culminated in this year's Galaxy Note 4 - a remarkable phablet which puts its competitors to shame - and its Note Edge variant. Too bad Samsung's habit of coming up with several versions of the same thing - most notably its tablets - is distracting consumers from seeing how innovative this new device is. 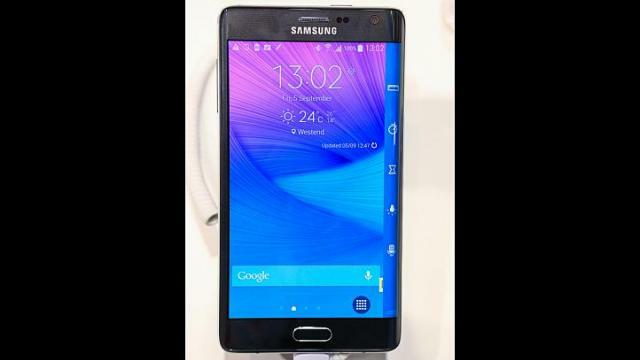 After all, it is easy to see the Note Edge as just another variant of the Note 4, but with a curved screen thrown in. Doing so, however, would dismiss the cutting-edge features introduced by the Korean tech giant with this phablet. The Note Edge shares many specifications with the Note 4 and the key differentiator is the sloped screen on the right side of the display which curves downwards. This effectively produces two screens on the 5.6-inch display, with the strip on the right delivering a second screen option and a different set of information apart from the main screen. However, this is still one physical screen, as there is no break which separates one display from the other. The curved screen, which adds 160 pixels to the width of the main screen, has its own menu and interface controls. It replaces the bottom dock icons of your screen and offers a place to park conveniences, such as short cuts to the camera, dialler, contact and other frequently used apps, for quick access. This means you have more real estate on the main screen for items such as app icons and widgets. If your phone is in stand-by mode, notifications, such as e-mail alerts and SMS, are displayed on this strip of the display. At night, the panel can be set to be an always-on clock display. This feature disappears during the day. The edge screen has other panels which you can customise as well. For example, The Straits Times is developing a news ticker app which aims to use this screen to scroll through the latest headlines. Yahoo also has a news app which takes advantage of this feature. The included S Health pedometer uses it to display the number of steps taken and distance travelled. Also included are three simple games which you can play on the edge display. Expect more edge-optimised apps to come, as Samsung has opened up this part of its platform for developers. I like how this feature has made working with a smartphone more intuitive. For instance, when I am working on a document with the Note Edge, incoming calls are discretely displayed on the edge display. With other phones, an incoming call would usually take over the display or bring up a small but annoying pop-up window. While the curved edge is on the right side of the phone, left-handed users are not left out. The latest Note Edge update introduced screen rotation. Simply use the phone upside-down, switch the screen orientation and the edge screen will adjust accordingly by displaying text in the right direction. The new screen-rotation feature also has another use. It makes the text on the edge screen appear upright when the phone is placed flat on its back. In camera mode, all the button controls appear in a row on the curved display. You do not have to search to the left, right, top or bottom of the regular display to locate the controls. Of course, rotating the phone vertically means all the controls are now bunched together on the edge screen, which can be rather uncomfortable when taking a picture with one hand. The Note Edge shares the same excellent 16-megapixel camera as the Note 4. While some may consider the latest Apple iPhones as the gold standard for phone cameras, the shooter in this Samsung is arguably better. With the power-saving feature switched on, the Note Edge lasted a day with moderate use - commendable considering its power-hungry display and processor. If you are a fan of the S Pen, the one included with the Edge offers more precision controls and works like a mouse, in that users can use the pen to copy and paste objects with greater ease. My biggest gripe is with Samsung's pricing of the Note Edge. The $1,248 price tag is $160 more than that of the Note 4 and, while the curved screen is useful, this tiny strip of real estate might be too expensive for some people to invest in.